First bloomer from a JimL cross. Indeed, yikes: really nice combination from both sides of the family tree. The sumatrana: could you describe it please, sir. Darker? Lighter? Personally, I really like the more contrast in the lighter forms of sumatrana, but I doubt that they could produce something as rich as this even with the "color intensification factor" of indigo violacea. Love the lighter filigree touch on the lip, by the way. Congratulations. Grow it up big and get that thing awarded. Here's the sumatrana. Not a lot of markings but I used this one because of it's yellow base color where most have a white base color. It seems to have paid off because we have a red flower with darker red markings. 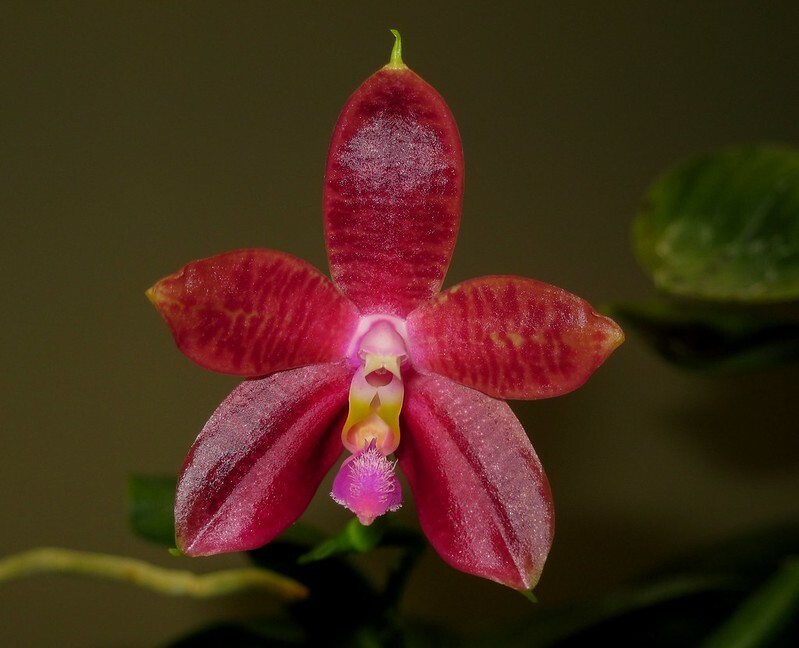 A shout-out to Dr. Stock for all his good advice for hybridizing red flowers. P.S. This sumatrana only had one flower on the first blooming. very nice, I like the yellow base color! My Phal sumatrana x violacea indigo from you has two spikes two buds right now I also have a Phal sumatrana ('Mantis' x 'Arrowhead') seedling from you in spike with 3 buds, first bloom. 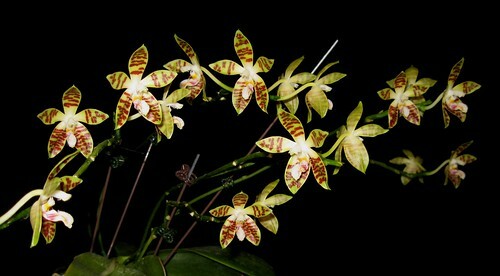 The 3 seedlings of Phal sumatrana x speciosa from you all bloomed, all VERY fragrant and colorful! And the 3 Phal corningiana x speciosa seedlings from you are in bud right now too. I'll be sure to share with you when everything has bloomed. Keep making awesome hybrids Jim! Thanks Bryan! Can't wait to see them. That's really nice Jim. Love how the sumatrana came thru, makes it look like the flower has tiger stripes. I do believe that is one of JimL's own crosses. He sometimes sells on ebay.